Scotty and I have recently returned from a fabulous trip to Canada. We loved the people, the food and, of course, the gorgeous scenery. And I loved the opportunity to test how far my French language skills had come since our last visit to France, earlier this year. If I’m being candid, most of the time I’d rate my French as pretty ordinary. This is in spite of the fact that I’ve been wanting to learn French for as long as I can remember. It’s the one thing that’s on my goal list year after year. And my desire to learn the language never seems to go away – no matter how often I tell myself that I’m wasting my time. But, I had to reset my thinking almost as soon as we landed in Canada. Because as we walked through airport, I was struck by how much French I understood in bilingual Toronto. I could read the French signs and understand the announcements that were delivered in French. My feelings of surprise continued as we made our way across the French speaking parts of Canada. While I wouldn’t suggest that I’m great, I’d come far further than I would’ve given myself credit for. Which naturally got me thinking about the things that had helped me progress my language learning – both the big and the small. And I thought I’d share my top three tips in case you too are wanting to learn French. Keep a growth mindset. Adults are generally used to feeling competent and in control. But learning any new skill – let alone something as complex as a language – opens you up to feeling incompetent. When you forget vocabulary or grammar points or mispronounce every second word, a whole stack of uncomfortable feelings can arise. It’s easy to feel silly, frustrated and every other negative emotion in between. 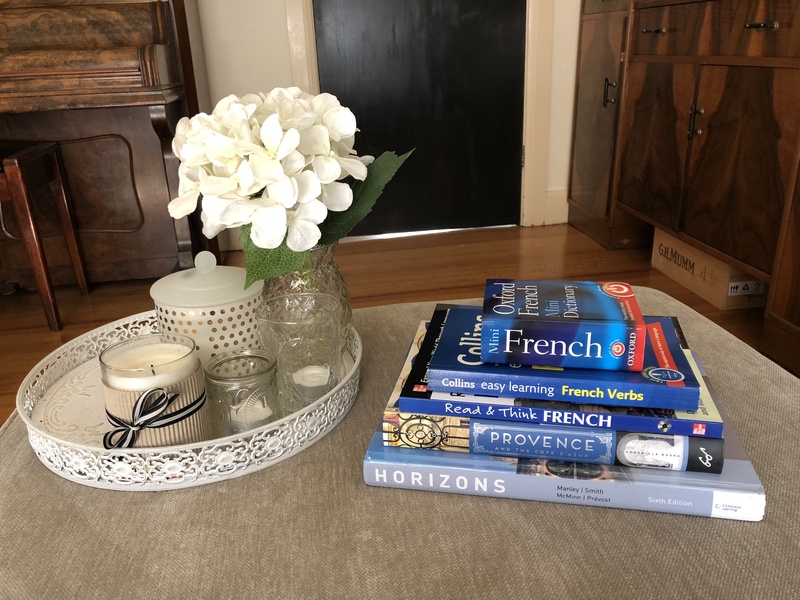 Keeping a growth mindset and remembering why you originally wanted to learn French can be helpful when you start to feel like you are never going to master the language. Commit and get a tutor. I’d dabbled with audio methods and group classes for years. But it wasn’t until I got serious and hired a private tutor that I started to gain any traction. Not only does my brilliant, patient tutor tailor my lessons to suit me, but she also holds me accountable to my learning goals. Knowing that I have a Skype meeting with her every week encourages me to study (and submit my homework). When searching for a tutor many things will influence your decision, including the cost, time commitment and skill set of the tutor. But make sure you also consider whether you like your tutor and if they can inspire you to learn. As I mentioned above, learning something new can put you in vulnerable position. This is a lot easier to deal with if you feel like you are working with a friend. Make time to study, learn and practice. Yes, obvious. But learning a language takes regular practice. It’s disappointing I know, but there is no magic wand. I’ve come to understand that when I study a little bit of French every day through the week, my Friday morning lessons go so much better. Do you have any tips to share for your fellow francophiles who are wanting to learn French? If so, make sure you take a moment to share them in the comments section below. You made some good points! I improved my vocabulary by reading about a subject I love – interior design. While we still lived in England I subscribed to the French magazine ‘Art et Deco’, it really helped. Thank you Sharon. And thanks too for the reminder. A while back I was reading style books in French – I really must do that again!! Thanks for that Carolyn. You raise a very good point about the perceptions that travellers can take on about a city. Because the airport had dual signage, our hotel had menus printed in both languages and the conductor on our train switched easily between languages it felt like we were in a bi-lingual part of the world. Thank you for pointing out the reality of the situation. A tutor is indeed far more effective than DIY. What you said about how the lessons are tailored to you is important–the more relevant the lesson, the likelier you are to remember it. The best way to learn, the French tell me, is “on the pillow”–get a French lover! Not always possible. You can get French into your ears while you’re commuting or working out by listening to French podcasts or French music. Every bit helps! Haha. Thank you Catherine for the most creative suggestion so far. I’m not quite sure what Scotty would think, but I can see that it could be quite effective. I think you are right about the fact that every bit helps – sometimes it feels like you need formal study time, but you can squeeze a lot of learning into small periods of time. I agree with the recommendation to work with a language coach, and I think that it is important to have a conversation with your coach at the very beginning to identify and characterize exactly what your own specific language goals are. Like everything else, if you don’t know where you want to go you will never get there. Do you want to stick to speaking and listening skills? Or do you want to include writing, and perhaps even some poetry or other literature? Do you want to put informal speech to the side and concentrate on ‘vous’, or are you particularly interested in becoming familiar with the casual language of contemporary movies and media? Do you envision travel, or do you have other reasons to want to become fluent? Do you even want fluency, or are you only looking for a comfortable competence? The whole point of a language coach is to get you where YOU want to go, without the rigid structure of a prefab curriculum to decide what you will learn. Rather, you and your coach are setting off together on a path of your choosing toward your mutual goal. For someone who has studied French but has never been able to quite put all the pieces together, a coach can provide the missing piece of the language puzzle, but only if you work as a team. Perfectly said Alisa. I couldn’t agree more!! Thanks Jo. It was a post or a comment of yours that actually inspired me to get my own tutor (thank you so much). I realised that ‘dabbling’ wasn’t working for me. The magazine subscription keeps coming up as a suggestion – I’m definitely going to have to look in that one. If you have the time and money to live your dream, study at the Sorbonne in Paris. They have courses of different lengths and levels aimed at foreigners. The cost is reasonable in an effort to promote French culture in the world. I spent 6 months in Paris just after my retirement and it really was living the dream. Ooh Joanne – what an amazing experience. Not something that I could consider right now. But definitely something to keep in mind for the future. ← Should You Buy It Again?